Juneau, AK – Alaska commercial fishermen surveyed this summer told UFA that taking good care of Alaska salmon habitat is vitally important to them. In fact, it’s an even higher concern than price! At Pacific Marine Expo this week in Seattle we will share all of our survey results and reopen the survey for fishermen who would still like to weigh in. “We guessed that Alaska commercial fishermen would tell us that they care about habitat. What’s interesting are the reasons for this high value placed habitat. Habitat for our salmon sustains our identity, livelihood, and families; and what’s exciting is that fishermen told us they are willing to go to the mat to protect those,” said Lindsey Bloom, UFA Board Member and Salmon Habitat Information Program (SHIP) Program Manager. UFA will present the full survey findings at Pacific Marine Expo during a panel discussion about Alaska salmon habitat on Thursday. Results include trusted information sources, key habitat concerns, policy priorities, and how fishermen get their news. “Fishermen shared very rich data and opinions about what matters to them. The survey is a treasure trove of information, useful for news outlets, policy makers, agency staff and others who care about what’s happening with fishermen and our industry,” said Bloom. Just for Pacific Marine Expo, UFA will re-open the survey. 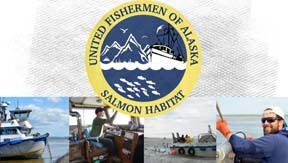 Alaska commercial fishermen can take the survey online, or on paper at the UFA booth #513 or the salmon habitat presentation. “Based on these results, our association has a clear mandate to continue engaging in Alaska salmon habitat issues on behalf of commercial fishermen.” said Bloom.